Avocado Stuffed with Tomatoes, Thyme for Cooking easy first course for summer. Avocado halves, filled with a warm tomato, pepper and onion salad make a lovely first course. Sauté onion, pepper, chili powder in oil for 5 minutes, until just starting to get tender. Add tomatoes, herbs, good oil and vinegar to skillet. Stir gently then let rest 5 minutes. 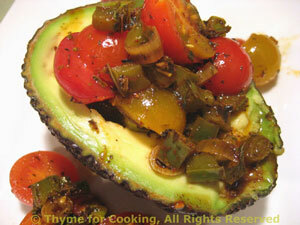 Spoon half of the tomato salad into each avocado half and serve.